The I-O 5755e IPDS/SCS Printer Gateway is a high speed Ethernet-in, Ethernet-out IPDS/SCS gateway print server designed to convert native IBM host print jobs to PCL, allowing them to be printed by a laser printer on the LAN. Supporting up to three printers, the 5755e delivers IBM AFP/IPDS and SCS printing via TCP/IP, providing the control and printer feedback found in an IBM host environment. 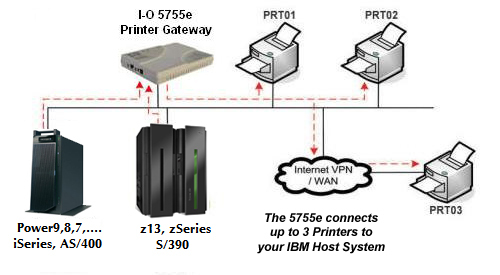 If you have more than 3 printers you need to have connected to your IBM host, the 5765e IPDS Print Server Gateway may be a better solution. It will support up to 10 network attached printers, copiers or MFPs. Click here and you will be taken to the 5765e Gateway page. Attached to the LAN, the 5755e supports high-speed, high-performance printers. Without the bottleneck of a slow parallel port, the 5755e supports over 100 pages per minute. Whether printing from an IBM iSeries-AS/400 or a zSeries-S/390, fast printing can be obtained with laser printers supporting port 9100. In addition to the Ethernet connection, the 5755e has a parallel port to directly attach one printer (laser or dot-matrix). The 5755e offers the same reliable, full-function IBM host printing and control found with direct Twinax/coax attached printers. With the 5755e, IBM host print jobs are not lost in the black hole of LAN printing. The 5755e provides bi-directional communication between the printer and the IBM host, allowing error reporting and page range printing. I-O's Configuration Utility software is included with every 5755e. Whether selecting TCP/IP or SNA, configuration is made easy through the use of a menu-based utility. Data conversion is accomplished at the 5755e and sent to the printer via the Ethernet LAN. The 5755e takes advantage of high-speed, high-performance printers without the bottleneck of the parallel port. Three laser printers can be configured as AFP/IPDS and/or SCS virtual printers. IBM host printing to LAN attached printers can be accomplished easily in an Ethernet environment. The 5755e provides a bi-directional communication between the host and the printer, via port 9100 and PJL commands. The printers can be attached locally or remotely via a WAN or VPN network. Printers do not need to be next to the 5755e. One laser or dot-matrix printer can be directly attached to the 5755e for IBM host to LAN printing jobs. All AFP/IPDS and SCS functions such as True Print Complete, AFP/IPDS and SCS Duplex, Page Offset, COR, Fonts, Barcode, are fully supported by the 5755e.